Remember #Juneathon? 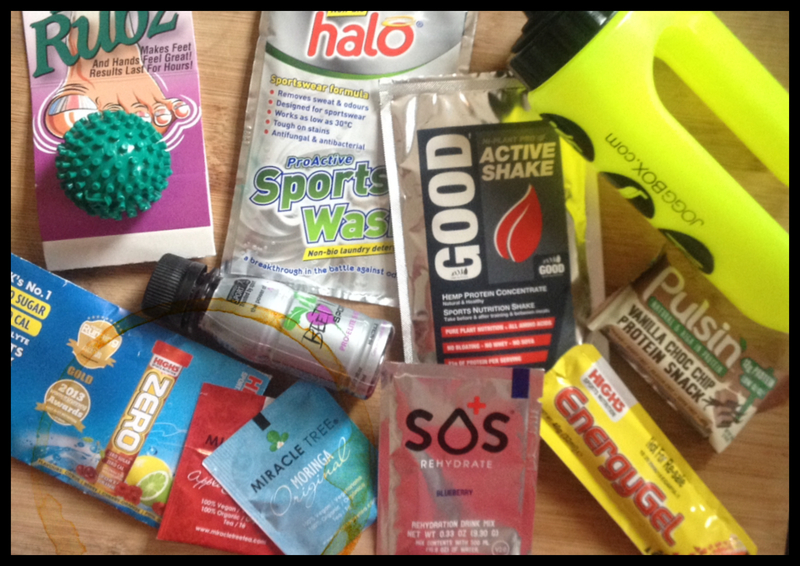 Were some people ran & blogged everyday of June, and some of us ran for about 3 days, then entered the prize draw for a Jogg Box anyway because we’re a cheeky sod? Yeah, I won a Jogg Box! JoggBox is a fun and exciting way to discover new running products and accessories. Each month, as a member, you will receive a box filled with the best nutrition running products out on the market. Discover also exciting new accessories and outfits designed to keep the perfect balance of comfort and style while running. The value of the items in a box is always bigger than the price you are paying for. I love monthly subscription boxes, I just want to sign up for them all, because it’s like someone sending you a present every month. If only they were actually presents (or prizes like this one) and I didn’t need to pay for them! This one should have been £15 + £3 P&P, but you can get them a bit cheaper if you sign up for a Quarterly or Annual subscription. I think the first #Juneathon I took part in someone was offering out HIGH5 samples, and I love freebies so I jumped on that band wagon, and I’ve been a fan of the HIGH5 stuff ever since. The gel were also what was on offer during the 1st Liverpool Marathon. I’ve got the Summer Fruits gel, which is good because I’ve never tried that one, and the drinks sachets I have are Cherry – Orange, I’ve never tried them either. So that will be fun. I got one of these in a Vegan Tuck Box (I’ve mentioned I like monthly subscription boxes right?) They’re vegan, soy free, gluten free and non GM. This is where you think they’re made of cardboard and dust and must taste the same, but they’re surprisingly tasty and there’s currently a little bit of a battle between me & my husband over who will get this one. At the end of the description for this it says “Taste salty.” Before that it says it’s a rehyrdation drink that prevents and combats mild to moderate dehydration in athletes. That should be good, the volume of coffee I drink in a day probably puts me in a permanent state of light dehydration. It’s also got 6 times more electrolytes than other sports drinks, because of SCIENCE! This is 98% concentrated beet root juice. I’m a little weirded out by that. I don’t know why, I’m a little nervous about trying it. I’m also amused that it suggests you should take it 1 to 12 hours before sport, so any time really just not while you’re actually out sportsing. It’s a protein shake that’s made of hemp. “It’s a complete natural source of protein to support your active lifestyle and immune system.” I’ve never tried a protein shake before, but it does say you can mix it with yogurts and cereals, so I might try it that way. This is sports laundry detergent. I’ve never considered that my sports bras might need a different was to my everyday T shirts. It kills bacteria rather than masking smells, according to the packet. I might save this for #Janathon,(as there’s no way I can slack through that, Cathy has said I have to!) and give it a real challenge. This is a weird knobbly golfball thing. You kinda roll it about under your feet and it makes them feel awesome. I haven’t tried it yet, but I love having my feet rubbed, so I’ll give this a good testing over the next few weeks I think & report back. It supposed to hook over your jogging bottoms, I think it might pull my pants down, but I’m willing to give it ago. There’s also a card with a discount for Sports Tape & another with a discount to Bobo’s Organic Juice too. But I’m probably not going to take them up on them.